With the majority of our workshop/installation team having been with us over 15 years, we collectively strive to deliver you the very best we can with a completely honest, open attitude, as you would expect from a family business. Our very personal approach and commitment to our craft means that we are able to offer you a great level of flexibility and choice throughout the process. Our constant commitment to product improvement and attention to detail enables us to provide completely unique, individually designed kitchens, bedrooms and studies. 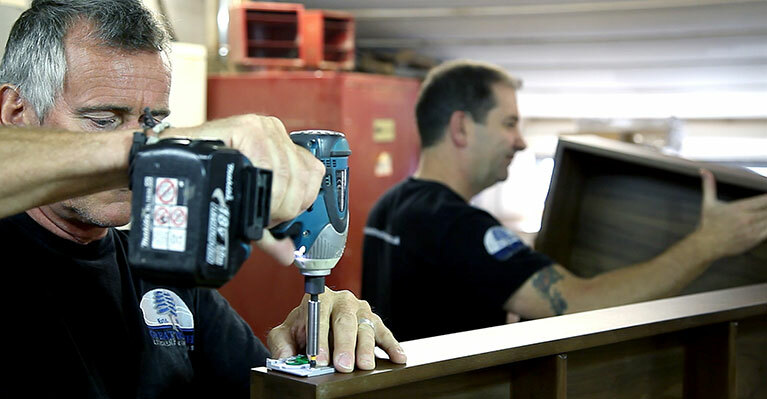 Using traditional methods, combined with over 100 years’ shared expertise in cabinet making/installation, and with a little helping hand from modern technology, every cabinet that we produce is individually made for you, to our exacting standards. We work hard to ensure our clients are investing in the very best cabinetry available. We pride ourselves on the quality and diversity of our product, and whether traditional, contemporary, or modern; kitchen, bedroom or study; all of our cabinetry is made by hand in the traditional way with the utmost care and respect. Our carcasses are typically made from MFC or plywood as we believe that these are the best materials for the task. They are glued, dowelled and screwed providing durability and strength, and importantly they are able to withstand the test of time. Our drawer boxes are made using solid timber, typically oak or walnut; using traditional dove-tailed joints, not only aesthetically pleasing, but also incredibly strong. Our solid wood drawers can be customised to suit each household’s needs, and sitting on fully extendable, 70kg-rated, soft close runners, they offer superb strength to support the modern family.